Located at the foot of the Jacques Cartier Bridge, the recently rejuvenated Place Charles-Le Moyne is a key meeting place for the city of Longueuil, housing a university, shops, offices and residential buildings. 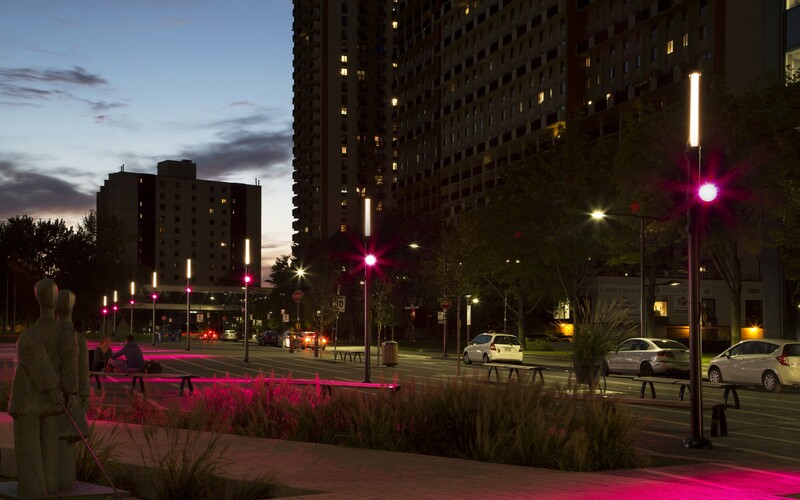 To emphasize the importance of this dynamic space, the City of Longueuil wanted a flexible, lively, lighting design, but without having to add additional light columns. The goal was to cover the whole site with a homogeneous light, but still giving existing structures and spaces a distinct and separate feel and all while using existing infrastructure. 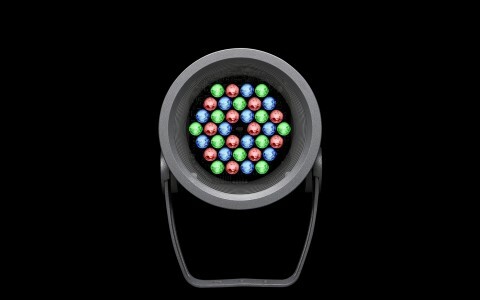 The City chose Lumenbeam Large Color Changing luminaires RGBW with narrow, 6° and 10° beam angles. The luminaires are installed on 18 existing light columns, which frame the square. “By combining these luminaires with Lumentalk, we were able to create linear lines of light that lead towards the center of the plaza,” Corbeil says. 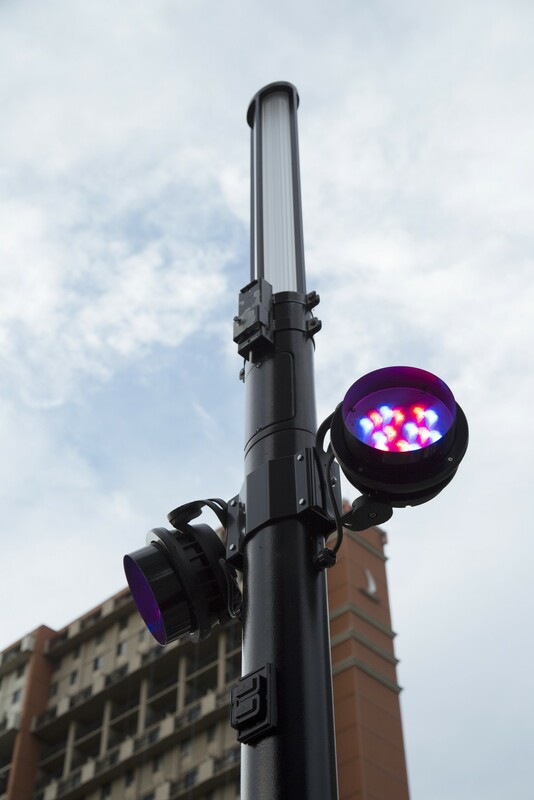 The city chose Lumentalk technology, which allows digital control of LED luminaires over existing power lines. 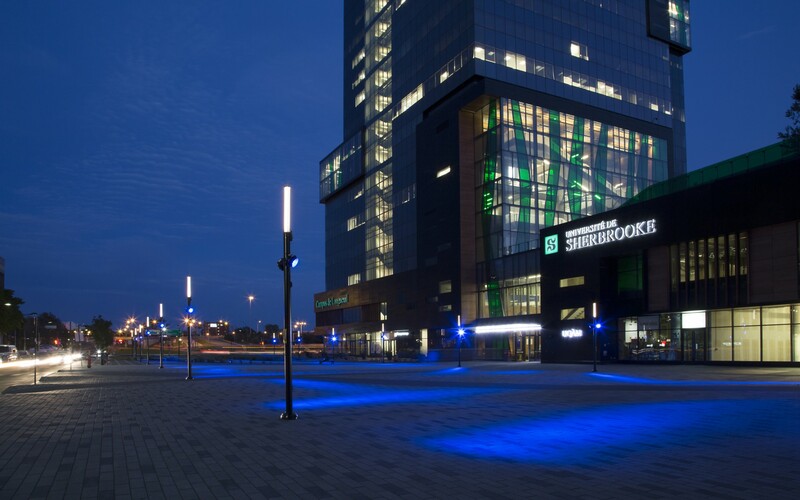 The result is a flexible, dynamic lighting design that brings a modern touch to the urban heart of Longueuil. 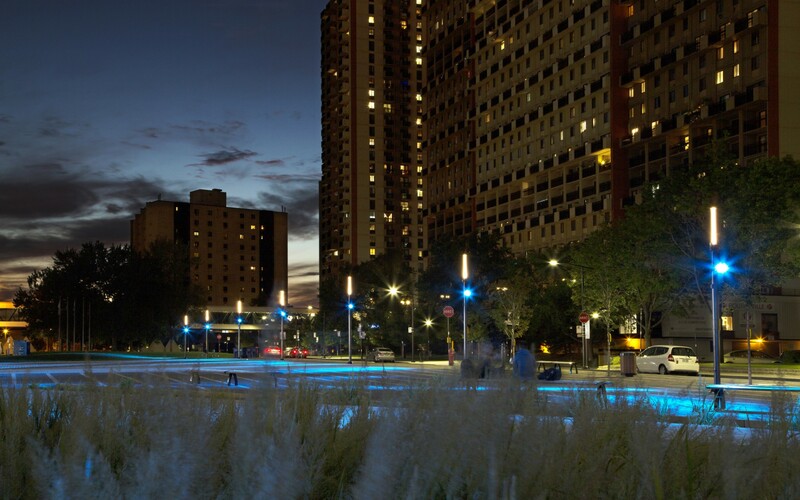 The City of Longueuil used Lumentalk technology and Lumenbeam Large RGBW luminaires to illuminate the Place Charles-Le Moyne - without altering existing infrastructure. 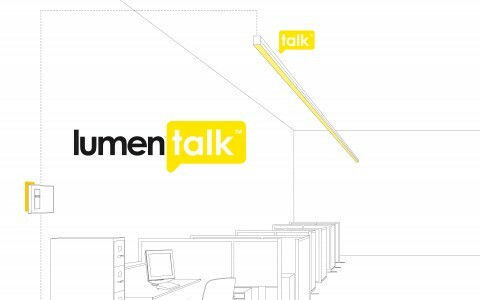 Lumentalk allowed us to use the existing power lines to communicate with the new LED spotlights, which was essential since it was impossible to re-wire for data in the existing conduits. Located at the foot of the Jacques Cartier Bridge, the recently rejuvenated Place Charles-Le Moyne is a key meeting place for the city of Longueuil, housing a university, shops, offices and residential buildings. 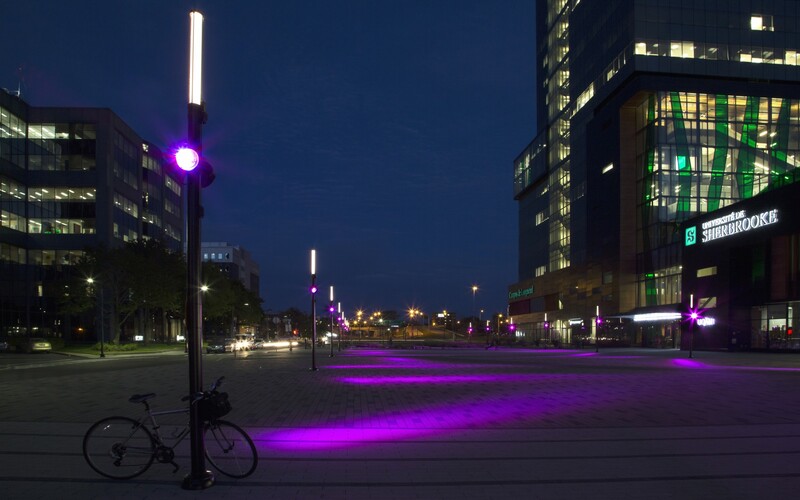 To emphasize the importance of this dynamic space, the City of Longueuil wanted a flexible, lively, lighting design, but without having to add additional light columns. "The goal was to cover the whole site with a homogeneous light, but still giving existing structures and spaces a distinct and separate feel and all while using existing infrastructure," said Jasmin Corbeil, Project Manager, Service parks and green spaces of the City of Longueuil. To accomplish this, the city chose Lumentalk technology, which allows digital control of LED luminaires over existing power lines. "Lumentalk allowed us to use the existing power lines to communicate with the new LED spotlights, which was essential since it was impossible to re-wire for data in the existing conduits," he said. 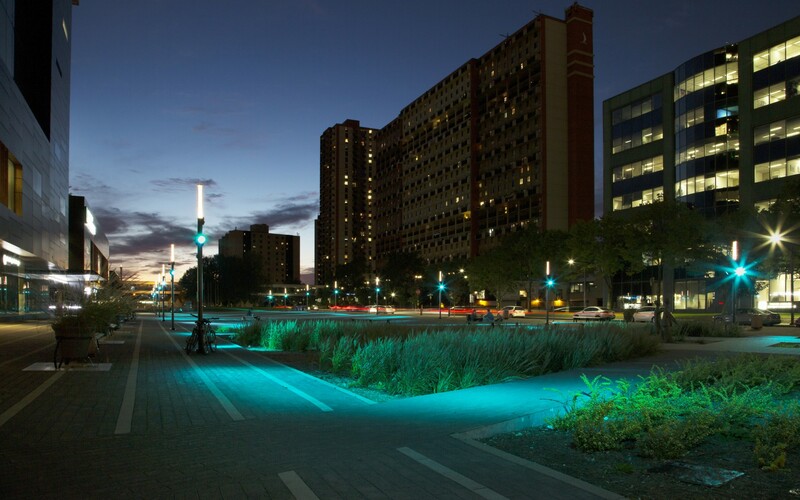 The City chose Lumenbeam Large Color Changing luminaires RGBW with narrow, 6° and 10° beam angles. 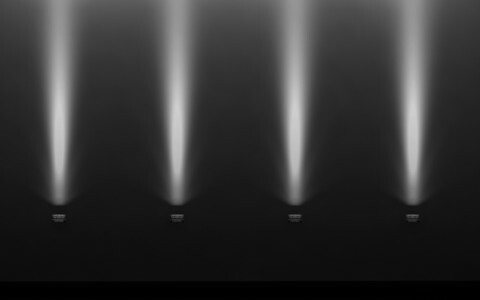 "The Lumenbeam luminaires had the double advantage of being flexible enough to change orientation, while also integrating harmoniously with the existing light columns," Corbeil said. The luminaires are installed on 18 existing light columns, which frame the square. 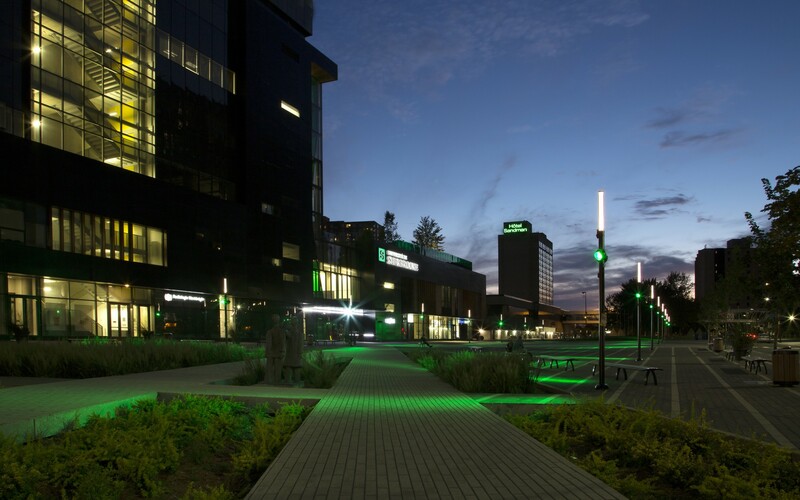 "By combining these luminaires with Lumentalk, we were able to create linear lines of light that lead towards the center of the plaza," Corbeil said, adding that the City did not choose Lumenpulse solely for the quality of their products. "It was their service that really dictated our choice. The Lumenpulse team actively supported us in the design of the lighting system and the harmonious integration of their products to the project," Corbeil said.